Ford has again taken an approach of covering up the engines of the 2015 Mustang with covers that suggest something other than what lies beneath. It’s a little better this time that it was last, but it still spells “fake”. Lets start by reviewing the 2011-2014 Mustang GT. As you can see, the engine cover suggests that it is an intake manifold itself, with black plenum chambers to each side of the runners, and chrome clamps on each runner. The runners are aluminum-colored and exposed. The overall suggestion is perhaps a reminder of the Yamaha SHO V-6 engine, which featured the most intriguing (attractive as well as functional) intake manifold ever designed. Except this isn’t the SHO manifold, and it’s not a manifold at all, it’s a plastic engine sound cover. In other words, like the current Mustang’s array of fake scoops on the hood and body, it suggests something that isn’t there. The following two slides are from the introductory briefing given to members of the press on December 5, 2013. We were there, and the following two slides are the first images anyone has seen of the 2015 engines. 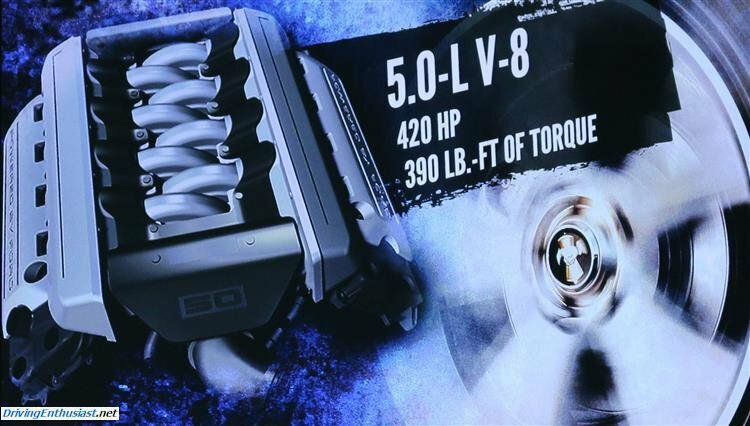 The horsepower and torque figures for each engine are preliminary, although Ford forgot to include the “+” signifying such on the slide for the Coyote. The final figures will be released closer to production, and – taking an educated guess here – we believe the Coyote numbers will be revealed once its basic donor engine from the upcoming all-new F-150 is revealed. 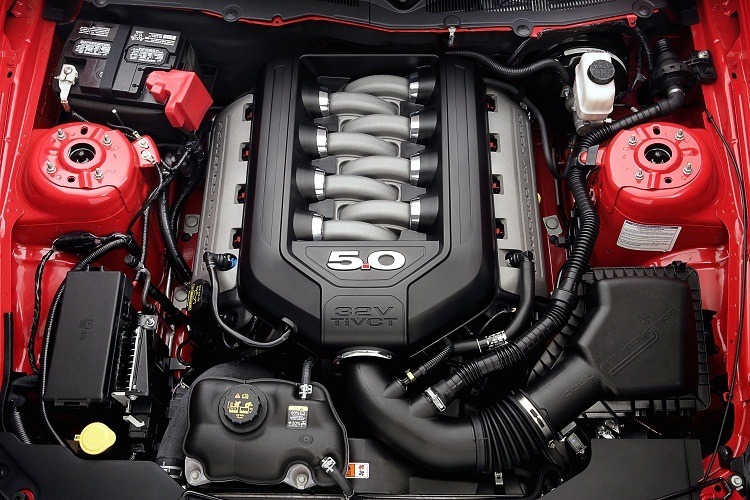 The revised Coyote engine in the 2015 Mustang takes the same direction as before, with the appearance of even larger silver plenums on each side. However, again, this is simply an engine cover. And those plenums are just plastic boxes that cover up the port fuel injection system wiring, fuel rails, and injectors. Fake, and we don’t even get a chrome “5.0” this time. 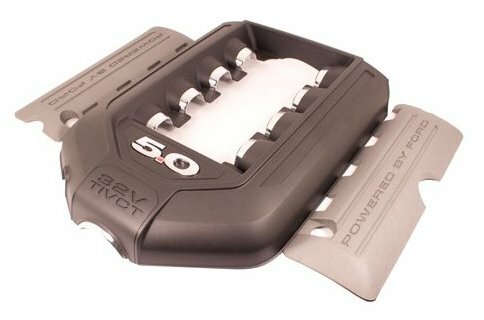 We do get the same plastic valve cover covers, again with the message “Powered by Ford” (as if the engine would be supplied by somebody else?). The new EcoBoost 2.3 engine has an odd cover, with a deep indentation in the middle, and it almost looks like a tunnel-ram intake manifold itself. As well as what appears to be a cover over the actual intake manifold to the right. 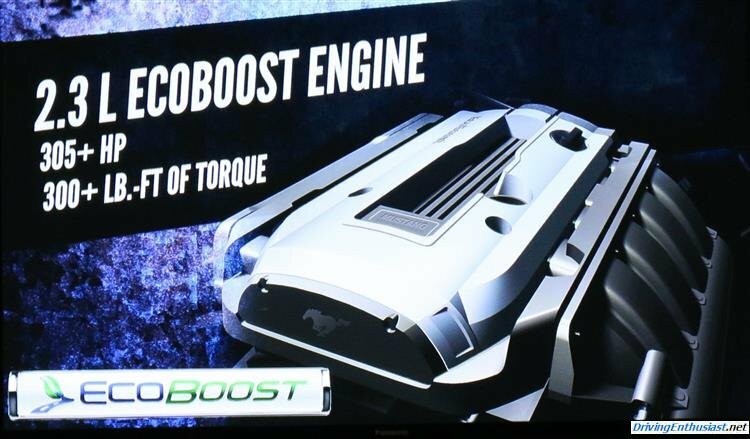 Baffling again, and especially for an engine that is meant to highlight the EcoBoost technologies of the future. As we detailed in our earlier post, these engine covers have the appearance of having been designed by Ford’s marketing department, not it’s engineers. Form precedes function, instead of following it. Whatever happened to the good old days of a simple aluminum intake manifold and a painted valve cover? When the marketing people get involved, function is secondary. Although to be fair there is one technical function a modern engine cover is designed for that is important: noise reduction. Clacking injectors and noisy direct-injection pumps take away from the driving experience, make for a less than enjoyable daily driving experience, and (for pure driving enthusiasts) mask the basic engine noises that tell us by sound when to shift without having to look down at the gauges. So we accept the need for covers, but object to the “fake” aspect of them. The Mustang design formula has for most of it’s life been besieged by fake scoops, vents, and other poseur objects. The new car sheds almost all of these… the fake hood scoops are gone, and the fake C-scoop is gone at last. And we believe it’s time that the engine compartment warrants that same approach. For a driving enthusiast, the engine compartment is something we should be proud to show off – with the technology clearly visible and sable to stand on it’s own and without being adorned with costume jewelry.